Musikefterskolen from Humble in Denmark has been playing concerts at the Berlin Cosmopolitan School for 7 years now. Every year this event is one of the musical highlights at BCS. On December 13 not only did our Primary and Secondary students see our guest from Denmark “rock the house”, we also ran a number of music workshops with the Danish and BCS students collaborating musically throughout the morning. 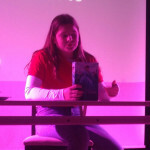 The results of these workshops were performed at the Secondary gig in the afternoon. On December 6 the annual football tournament of the project “Alle kicken mit!” took place. Two BCS girls teams took part. For the grade 1-2 team it was the second tournament and for the second time in a row the girls took second place. For the grade 3-4 team it was the first tournament. After learning the mathematical principles of surface area-to-volume ratios, students were asked to apply this knowledge to how cells carry out the vital functions of taking in nutrients and getting rid of wastes. Since the relatively low surface area-to-volume ratio of large objects presents a challenge to living things, students explored ways that biological structures can maximize surface area. The school’s internal reading competition took place today (December 10). Two class winners each from 6a and 6b took part. One own and one foreign text was read. Two 7th graders, Lotte and Eva, were also on the jury. The two winners Luna (1.) and Julina (2.) won book vouchers and Luna now enters the next round and competes against the winners of other schools. Congratulations to the winners & good luck, Luna!